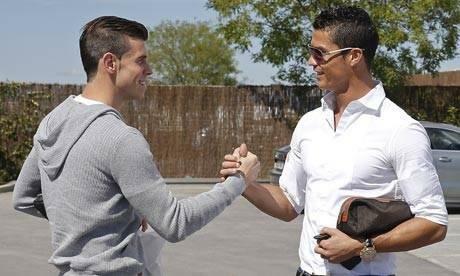 Gareth Bale and Cristiano Ronaldo shake hands before a Real Madrid training session. For Real Madrid the chance to show off £166m worth of talent was too good to pass up and the hope for the Spanish giants is that Gareth Bale and Cristiano Ronaldo get on this well when it comes to deciding who takes the free-kicks. There has been speculation that Bale's arrival at the Bernabéu this summer will have bruised Ronaldo's ego but the pair were pictured on the club's Instagram account greeting each other like old friends when they met for the first time at Real's training ground on Wednesday, smiling warmly and sharing an embrace, even if the cynics may point out that the occasion was stage-managed by the club and that the players knew the cameras were trained on them. Bale became the most expensive player in the world after his €100m (£86m) move from Tottenham Hotspur this summer, trumping the £80m that Real paid Manchester United for Ronaldo in 2009, and it has been suggested that his style of play is too similar to the Portuguese, who is reported to be unhappy about the £42.5m sale of Mesut Ozil to Arsenal. Whether Carlo Ancelotti can fit them both into his side could become clearer on Saturday night, when Bale hopes to make his debut for Real at Villarreal after making his first appearance of the season as a substitute for Wales in their 3-0 defeat by Serbia on Tuesday night. The 24-year-old, who is Ronaldo's junior by four years, suffered various minor injuries over the summer, restricting him during pre-season, and he has only just returned from a groin problem. Yet for the time being the only competition between the pair appears to be who can put more product in his hair. It is also unclear whether they had an impromptu arm-wrestling competition once the cameras were put away, or whether Ronaldo pointed out that Bale's outfit was a bit too grey for his first day at a new club.